bringing in an unusually large $110,000 worth of cargo.(6.3). The Howland family, principal owners of William Hamilton, hired Luther to captain their ship Logan. The ship left New Bedford in May 1838 when Luther was 24. He also left behind a fairly new bride. Elisha Thornton, a prominent New Bedford apothecary, had consented to Luther's marriage to his daughter Mary, which occurred in November of 1837. (6) Mary's grandfather had been a prominent minister with the New Bedford Friends Meeting. Her mother descended from some of the founders of Dartmouth, Massachusetts, and later the whaling center at New Bedford that grew from within Dartmouth. The core members of I. Howland, Jr. & Co., owners of Logan, were her cousins. Sylvia Howland, famous in her time for inheriting the Howland shipping fortune (but eclipsed in fame and wealth by her granddaughter Hetty Green), included Mary's mother in her contested will. Luther may have come into contact with the Thornton family through business. Elisha Thornton, as a druggist and as an agent for the medicines prepared by others, supplied medicine chests for ship's captains. 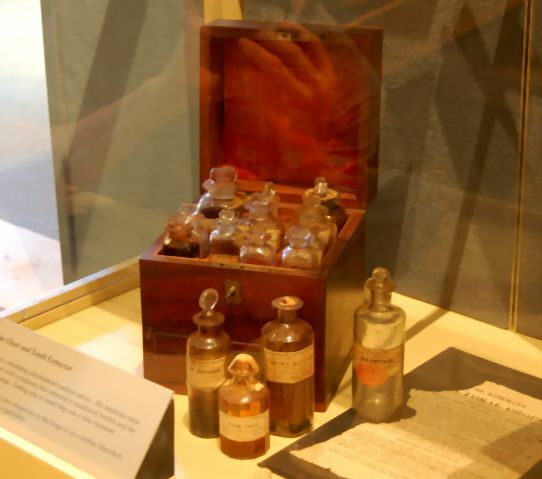 Although he didn't advertise as such, medicine bottles with the Thornton's labels can be found in chests at The New Bedford Whaling Museum and at Mystic Seaport. He could easily have provided Luther and perhaps John Briggs with their medicine chests. The Thorntons were among the more prominent New Bedford families in the first half of the 19th century. Elisha's children married into like families, but Mary was an exception. The Briggs did have some respectability, though. By 1837 John had had success in his whaling trips, enough to have bought a house and to have become a co-owner of the ship Frances with Gideon and William Allen, brothers among the mercantile elite of New Bedford. What they didn't have in pedigree was made up in a measure of financial comfort and, very likely, good character. The Marsh diary (mentioned later) shows that Luther was educated beyond the basics. The records of the New Bedford Monthly (Friends) Meeting report that Mary married a man who was not a Friend. She was asked about her frame of mind in the matter and she said she would be attending a different church with her husband. The Briggs family were Congregational/Unitarian before and after they were in New Bedford, but Luther and Mary were married by Rev. Charles W. Morgridge of the First or North Christian Church in that town. Although she was disowned by the New Bedford Meeting, family tradition says that Mary was not completely shunned by the church and that there were Friends at their "wedding supper." This very likely took place at the Thornton house at 20 Seventh St. in New Bedford. The Elisha Thornton, Jr., house was bought in a somewhat dilapidated state in 2000 by the New Bedford Historical Society to save it from the cliche destiny of a parking lot. Unable to restore the building themselves, they sold it back into private hands. The house was allowed to deteriorate for a number of years and has been demolished. Luther and Mary lived there with her parents for several years before renting rooms across the street at 17-19 Seventh St. in what had been the Friends Meeting House. The Historical Society had previously bought this and another house, both of which were owned in the mid 19th century by Nathan and Polly Johnson, an African-American couple, as part of their mission to preserve and educate about the ethnic heritage of New Bedford. The Johnsons, therefore, were the Briggs' landlords. About this time Frederick Douglass was brought to New Bedford by several of the town's Friends who were active in the Underground Railroad. Joseph Ricketson, Jr. was one of them. Joseph was Luther's brother-in-law, having married Mary Thornton's sister Frances. Joseph Ricketson, Sr., married Mary Thornton's aunt Anna Thornton and later her maternal aunt Sarah Russell, making the Ricketson/Thornton connection quite strong. The Johnsons housed Douglass for a time at their own house next to the old Meeting House. The former Friends Meeting House across the street from the Thornton house. The Briggs, Thorntons, Johnsons and Douglasses undoubtedly had social contact, and further research may reveal a closer tie to anti-slavery efforts. More discussion about the Thorntons in this respect can be found at Mary's biography page and about the Briggs and Unitarianism at Luther's father's page. It is undoubtedly significant that the church that Luther's father and stepmother helped to found in Rochester, New York, hosted the first woman's suffrage convention. The Unitarians were notable as well as the Friends for their openness to civil rights. Luther and his family were known to attend at least one service by civil-rights advocate Henry Ward Beecher at Plymouth Church, Brooklyn, although the subject of the sermon isn't known. (6.1) Crew lists reveal that the men (and boys) who populated whaling ships were multi-national and multi-racial. Natives of Portugal, Sweden, Scotland, Peru, Chile, Hawaii and Tahiti were represented among John and Luther's crews, as well as African and Native Americans. Voyages to the Pacific took whaling captains and crews away from home for years at a time. Logan was away between May 1838 and December 1841. (6.1) The ship was in "Otahieta," a spelling ocassionally used for Otahiti (Tahiti), by July 1838 and the crew was in that area for nearly a year. They sailed to (or near) "Santa," perhaps Santa Elena, and the ports of Tumbes and Paita in Peru between March of 1840 and August of 1841. In April 1841, Luther took the ship to "Charles Island" (Floreana) in the Galapagos, where they stayed for about a week. This was about 6 years after Darwin's visit and nearly the same time that Herman Melville was there as a crewmember of the Fairhaven whaler Acushnet. This archipelago has long been frequented, first by the bucaniers, and latterly by whalers, but it is only within the last six years, that a small colony has been established here. The inhabitants are between two and three hundred in number; they are nearly all people of colour, who have been banished for political crimes from the Republic of the Equator, of which Quito is the capital. The settlement is placed about four and a half miles inland, and at a height probably of a thousand feet. In the first part of the road we passed through leafless thickets, as in Chatham Island. Higher up, the woods gradually became greener; and as soon as we crossed the ridge of the island, we were cooled by a fine southerly breeze, and our sight refreshed by a green and thriving vegetation. In this upper region coarse grasses and ferns abound; but there are no tree-ferns: I saw nowhere any member of the palm family, which is the more singular, as 360 miles northward, Cocos Island takes its name from the number of cocoa-nuts. The houses are irregularly scattered over a flat space of ground, which is cultivated with sweet potatoes and bananas. It will not easily be imagined how pleasant the sight of black mud was to us, after having been so long, accustomed to the parched soil of Peru and northern Chile. The inhabitants, although complaining of poverty, obtain, without much trouble, the means of subsistence. In the woods there are many wild pigs and goats; but the staple article of animal food is supplied by the tortoises. Their numbers have of course been greatly reduced in this island, but the people yet count on two days' hunting giving them food for the rest of the week. It is said that formerly single vessels have taken away as many as seven hundred, and that the ship's company of a frigate some years since brought down in one day two hundred tortoises to the beach. Logan's last port of call was Talcahuano, Chile, where the Scotten family boarded and sailed with the crew back to New Bedford. (6.2) Ever since Luther stepped onto William Hamilton, he had departed and arrived at the I. Howland, Jr. & Co. dock at 20 Water Street and the foot of Commercial Street. As first mate and then captain, Luther's duties on shore were centered here. It was an easy walk to the Custom's House, where paperwork would be taken care of and to such places as the Thornton's apothecary shop to pick up medical supplies. The rectangular notch in the wharf is where ships would be tied. This wharf and several above have since been joined to make what is now State Pier. 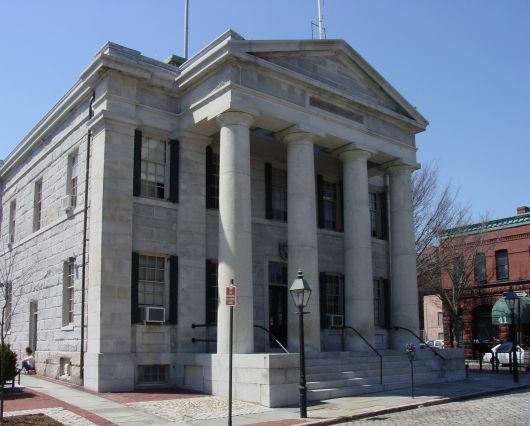 Below is the New Bedford Customs House, where captains filed their papers before and after their trips. 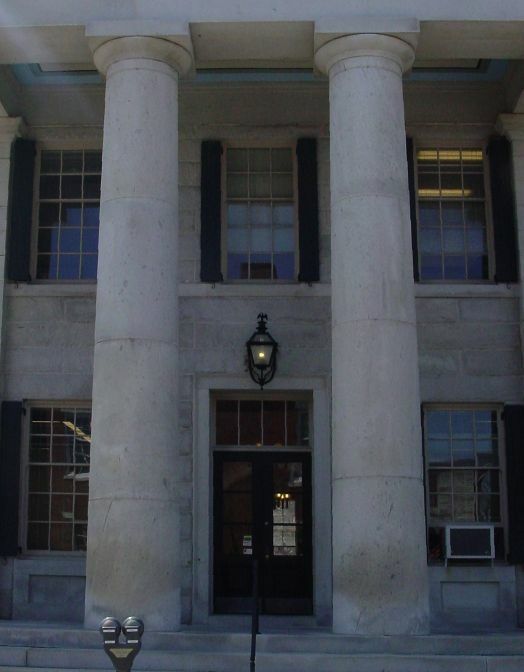 Completed by the mid 1830s, Luther's father came here for his last trip on Frances and Luther for all his trips as master mariner in New Bedford. Meanwhile, Mary waited, as she would for much of her married life, with hopes of Luther's safe return. She was pregnant when Luther left. Their daughter Mary was already 3 years old when he came back. This may have lead Luther to temporarily give up his life at sea. There is no evidence that he captained a ship for another 3 years. By 1844 the family had moved to Brockport, NY. Thornton's second marriage and death certificates say he was born there,(6.4) and is on the subscription list of the first (1844) edition of European Agriculture and Rural Economy. He is listed as "Luther Briggs, Brockport, NY." Father John Briggs had moved to Rochester, NY, about 1841, about 18 miles to the east. While he was at one point in the hardware business there with his brother-in-law, he became a farmer and also subscribed to the mentioned publication about the same time. Luther, Mary and the children obviously moved to Brockport to try a new lifestyle, but it didn't take. They were back in New Bedford by November of 1844, when Luther took the whaler Formosa out to sea. He left Mary pregnant once again, and this trip would turn out to be the longest she had to endure. The Briggs moved in with Mary's grandmother Bethia Russell at 13 South Sixth St. in New Bedford. Luther, Jr., was born there in 1845. Formosa was a 451-ton ship built for the packet business between New York, France and England in 1829. The Swift family, doing business at 17 Middle Street, bought it and fitted it for whaling. Luther took it on it's maiden voyage to hard labor in the Pacific. Formosa returned on 11 May 1849. (6.7) The Post says the ship left Honolulu on 23 December with 1000 barrels of whale oil, 606 barrels of sperm oil and 12000 lbs. of bone. The ship also brought 403 barrels of sperm oil as freight (on consignment, rather than from on-ship production). Another newpaper notice mentions the ship was "not full," which is readily apparent when considering that John Briggs brought back more than that 15 years earlier in what was undoubtedly a smaller ship and in significantly less time. It may never be known why more product wasn't brought back. Some whalers sent product back on other ships, presumably when their own ships were filled. The discovery of gold in California sparked a commercial fire-storm. Shipping companies and speculators rushed to get ships to San Francisco to capitalize on the need to transport people, supplies and cargo. When Luther died, his obituary, which was probably written by his son Luther, Jr., appeared in several papers. Three versions have been found, each different, but all with enough comparable wording to indicate there was one original source. They apparently were all edited, which altered some of the original statements. One claims that Luther "brought the first shipment of gold that was made to New York from California around Cape Horn." (clipping, paper not identified). Another (Brooklyn Daily Eagle) says "after the '49 his vessel was the first to bring gold as freight from California." Perhaps without any editing, another version says "His vessel was one of the first to bring gold as freight from California." (NY Herald) He certainly wasn't the first to do that, but who was first around the Horn won't ever be known. Ships sometimes made stops along the very long route home, so who was where and when is largely speculation, excepting their final arrivals. Sophia Walker sailed into Boston harbor on 7 May 1849 with gold on consignment, (Brkln Daily Eagle) and that ship not only is the first found to date in newspaper reports but an author stated in 1898 that it was the first as well, without giving a reason. (Frederick Hastings Rindge, "Happy Days in Southern California") An earlier report mentions gold arriving in private hands - not freight - with a passenger on Mt. Woolaston within the week before in New Bedford. (Milwaukee Sentinel, 5 May, from Boston Atlas) Several other ships came into New Bedford with private stashes on the 9th and the 11th. (NH Patriot) Formosa brought $9,000 worth of gold dust (a very small amount compared to the other ships) to Samuel "P." Morse and Deming Jarves on the 11th. (Pittsfield Sun and NH Patriot) Both of the latter men were from Boston. Morse was a merchant involved in some degree in shipping and Jarves was head of the New England Glass Co. (better known as Sandwich Glass). () Gold was used in the making of ruby glass. Some newspapers mention that English ships were also early in this commerce, and research into that may show they were even earlier than the U. S. ships. None of this activity in gold transport is mentioned in The Bedford Mercury. Luther probably never took Formosa to California. Ships sailing into San Francisco during the Gold Rush were known to lose their entire crews to the lure of finding gold. All references to New Bedford ships bringing home gold were whalers leaving from Honolulu, the foremost port among the Pacific Islands. Despite the distance, trade between Honolulu and California was brisk. Morse and Jarves probably had an agent on Oahu who bought the gold and arranged passage on Formosa. 1. His birth date comes from a New York Evening Herald obituary, obviously originating with information from the Briggs family, and matches what the family put on his gravestone in Green-Wood Cemetery, Brooklyn. Elizabeth Jenne/Jenney is said to have been the daughter of Abner Jenne/Jenney/Jennings (the last spelling was used by him later in life). Luther Jenne/Jenney is said to be another child of Abner and he named two of his children Elizabeth Briggs Jenney and John B. Jenney. John and Elizabeth Briggs named their son Luther Jenney Briggs. This helps confirm the relationship in lieu of documentation. Luther's full name is established in numerous family notes and in two public records. Thornton Briggs' (second) marriage certificate (Manhattan 1886 #62988) refers to him as Luther "Jennie" Briggs - Jenney surely being spelled phonetically by the clerk. Luther himself signed a ship's passenger manifest "Luther Jenney Briggs." 1.2. His obituaries mention this event occuring when Luther was 13. In 1857, Luther said that he had been a seaman for 30 years (Celia Marsh diary). 1.3 Alternatively, the ages stated for these documents may have been how old the person would be on their next birthday, but this doesn't seem likely. John says that Luther was 18 on the crew list of July 1831. He was actually 17, and as third mate, it may have been all the more useful to make the crew think he was a bit older. 3. Luther's newspaper obituaries say this, undoubtedly from information from Luther, Jr. They can be found in The New York Herald Tribune, The Brooklyn Daily Eagle. The New York Post and The New York Times carried his death notice on 5 January. 5. The earliest New Bedford city directory. 6.3. Alexander Starbuck, History of the American Whale Fishery, etc., p.
6.4. Thornton's second marriage record and his death certificate both give this as his place of birth (the marriage records says "Brookport"). 6.5. Letter from Orondo Beardsley to his family in New York State, 1 Nov. 1844, published in "The Heritage Newsletter" of the Linn (County, Oregon) Genealogical Society, vol. 18 (Sep. 2004), p. 87. 6.51. Ibid, p. 88, letter dated "12 month 21 1844," in the Friends (Quaker) mode. 6.52. Ibid, vol. 18 (October 2004), p. 91, letter dated 1 June 1847. 6.2. The New Bedford city directory for 1841 says the Logan sailed out of port on 1 May 1838 for Peru. The Customs House manifest gives the arrival date. 6.6. "Journal of a Voyage from New London to the North West coast of America in the Whale Ship Vesper Captain Clark," transcription at The Library of Congress "American Memory" website (http//:lcweb2.loc.gov/award/mymhiwe/log955/log955.txt_orig) 6.75. Information taken from the New Bedford Public Library's online crewlist database. Samuel Fairbanks Morse, 1850 census, Boston, "Saml. S. Morse," see ancestry.com OneWorldTree database for family information. No business information has been found other than a reference to Samuel F. Morse & Co. involved in shipping commerce in Mystic Seaport archives. Jarvis was also a ship owner (Some Merchants and Sea Captains of Old Boston (1918), p. 53.